All the affiliated organizations and C-o-Cs are requested to submit the following Memorandum to all concerned during the month of August, 2018. While taking the copy, in the first para delete the designations shown in brackets which are not required. Memorandum submitted to —————————- on the grievances of Central Government employees and Pensioners. We, on behalf of 32 lakhs Central Government employees and 33 lakhs Pensioners, seek your benign intervention to settle the following genuine grievances pending redressal for the last many years. We have brought these issues to the notice of the Central Government several times and also discussed in the negotiating forum which meets rarely. Inspite of our best efforts the issues could not be settled due to the unhelpful attitude of the Government. 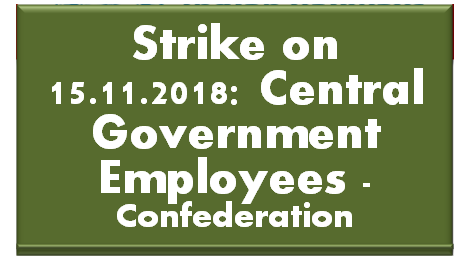 Having left with no other alternatives, we have been compelled to declare one day nationwide strike of Central Government employees on 15th November 2018. It is in this background, we are approaching your goodself for your kind intervention, so that the matter will be brought to the notice of the Hon’ble Prime Minister for early settlement. 1. Scrap Contributory Pension Scheme (Known as New Pension Scheme – NPS) and restore Defined Benefit Pension Scheme under CCS (Pension) Rules 1972 to all Central Government Employees, joined in service on or after 01-01-2004. Contributory Pension Scheme (called as New Pension Scheme – NPS) was introduced through an executive order with effect from 01-01-2004 for all Central Government employees who joined service on or after 01-01-2004. Subsequently Pension Fund Regulatory and Development Authority Act (PFRDA) was enacted to make it statutory. As per the NPS 10% Pay plus DA will be recovered from the employee each month and an equal amount will be contributed by Government. The amount goes to the Pension Fund and from there to share market. As per the PFRDA Act – “There shall not be any implicit or explicit assurance of benefit except market based guarantee mechanism to be purchased by the subscribers”. Thus it can be seen that the contribution in the Pension Fund is fully dependent on the vagaries of share market. There is no guarantee whether pension will be received 1 at the age of 60 years and even if received what will be the amount of pension. Now, many employees who entered service on or after 01-01-2004 has started retiring from service after completing 12 to 13 years service. They receive a meagre amount of 900 to 1700 as monthly pension, whereas as per the old pension scheme an employee with minimum 10 years service is eligible for 50% of last pay drawn as monthly pension, subject to a minimum of Rs.9,000/- per month, that too without giving any contribution to the pension fund. With meagre amount of Rs.900 to 1700 how a pensioner and his family can survive? It is this bitter reality that compels the employees to demand scraping of NPS and restoration of the old Pension Scheme for all those employees who entered service on or after 01-01-2004. 2. Honour assurance given by Group of Ministers to the Leaders of National Joint Council of Action (NJCA) of Central Government employees regarding increase in Minimum Pay and Fitment formula for Pay revision from 01-01­2016. Most of the recommendations of 7th Central Pay Commission (CPC) are retrograde, especially regarding Minimum Pay and Fitment formula. The NJCA representing entire Central Govt. employees had given notice for indefinite strike from 11th July 2016 demanding modifications in the recommendations of 7th CPC…. To avert the inevitable strike action, a Group of Ministers consisting of Shri. Rajnath Singh, Home Minister, Shri. Arun Jaitley, Finance Minister and Shri. Suresh Prabhu, then Railway Minister held discussion with NJCA leaders on 30­06-2016 and assured that the main demand of increase in Minimum Pay and Fitment formula will be considered favourably and for that purpose a High Level Committee will be constituted by the Government which will submit its report within four months time. This assurance was confirmed through a press statement issued by Finance Ministry on 06-07-2016. Even though two years are over since then, neither High Level Committee is constituted by Government nor the assurance given by Group of Ministers implemented. Entire employees and pensioners feel let down and betrayed. Now Government has made it clear in the Parliament that at present, no such proposal for increase in Minimum Pay and Fitment formula is under consideration of the Government. Consequent upon the appointment of 7th Central Pay Commission, the Government set up a separate committee on 19-11-2015 for revision of wages of three lakhs Gramin Dak Sevaks (GDS) of Postal Department. Even though the Committee submitted its report on 24-11-2016, the Government delayed its implementation for 18 months. Aggrieved by this, entire GDS employees went on 16 days indefinite strike and finally Government approved the wage revision. Even though the revised pay scales recommended by the Committee is approved with effect from 01-07-2018, the formula for pay fixation and calculation of arrears from 01-01-2016 to 30-06-2018, recommended by the Committee is modified by the Government to the detriment of the employees resulting in loss of huge amount of arrears to each Gramin Dak Sevak. Further some other recommendations of the Committee like composite allowance, raising the maximum limit of ex-gratia gratuity to 5 lakhs, three financial upgradations, enhancement of paid leave from 20 to 30, Enhancement of monthly subscription and insurance cover of EDGIS, Enhancement of working hours as per workload upto 8 hours, combined duty allowance, retirement on last day of the month on which GDS attains the retirement age etc. are either modified/curtailed or rejected by the Government. Recommendations like grant of Children Education Allowance, Emergency leave, Accumulation of paid leave upto 180 days, Insurance Scheme, Limited transfer liability, Voluntary Discharge Scheme, lesser qualifying service for Limited Departmental Competitive Examinations (LDCE) etc. are yet to be approved by the Government. Our demand for regularisation and grant of pension as per CCS (Pension) Rules 1972, Introduction of Medical Insurance Scheme, weightage increment for every 3 years service to seniors, etc. are not considered favourably by the Government. In short, the attitude of the Government towards the genuine demands of the GDS employees is not at all positive and Govt. want to continue the inhuman exploitation of GDS. (b) Regularisation of Casual, Part-time, Contingent and Contract Workers who are engaged for years together to perform the work which are permanent and perennial in nature. 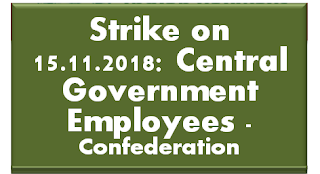 Thousands of Casual and Contract workers are engaged in various Central Government departments against permanent Group-C vacant posts and also to perform other work which is permanent/perennial in nature like sweeping etc. Consequent on introduction of ban on recruitment by successive governments in power, their number increased phenomenally. Government is not ready to regularize them and is not even ready to grant equal wage for equal work reiterated in the latest Supreme Court Judgment. 7th Central Pay Commission, headed by Justice (Rtd) Ashok Kumar Mathur and consisting of experts from various fields, has recommended a new formula called “Option-I” for fixation of pension of all pensioners retired prior to 01-01-2016 which ensure cent percent parity in pension between present and past pensioners. But, the Government has unilaterally rejected the recommendation on the specious plea that it is not feasible to implement. This has adversely affected the pensionary benefits of about 33 lakhs Central Govt. Civilian Pensioners. In addition to the above the following demands of the Central Govt. employees are also long pending. 5. Filling up of all vacant posts. There are about six lakhs vacant posts remaining unfilled in various Central Government departments. Government has issued orders for closure of 12 Govt. of India Printing Presses out of 17 Presses, inspite of the fact that the Parliamentary Standing Committee has opposed the proposal and recommended twice for revival and modernisation of all 17 printing presses. 7. Implement 7th CPC wage revision and pension revision of all Autonomous body employees and pensioners. There are about 600 Autonomous bodies under the Central Government. 7th CPC wage revision and pension revision is not yet extended to 80% of the Autonomous body employees and pensioners. Government has issued instructions banning all peaceful agitational programmes like dharnas, demonstrations etc. Various negotiating forums under the JCM Scheme are not convened regularly and has become almost defunct or ineffective. At present almost all employees in the Group B and Group-C cadres retire from service with maximum three promotions only. Our request to ensure minimum five promotions in one’s career is not considered favourably by Government. The above are some of the main issues agitating the minds of lakhs of central Govt. Employees and pensioners for long. Once again request your kind intervention.